Martha has a great flair for decorating. She keeps it classy with just a sparkle of a unique twist to make her home stand up and say hello. In the summer she knows how to trim her bushes and create gorgeous flower arrangements from the trimmings. In the winter her Christmas tree shines with homemade ornaments and her whole house smells of pine and cinnamon from the lush bows of pine strung along the staircases' banister. So when it came to the Halloween season, she wasn't planning on letting anybody down. She combined lush red and black silk roses in a gorgeous wreath. Then she added what everyone in the neighborhood was so jealous off, her eye for detail! 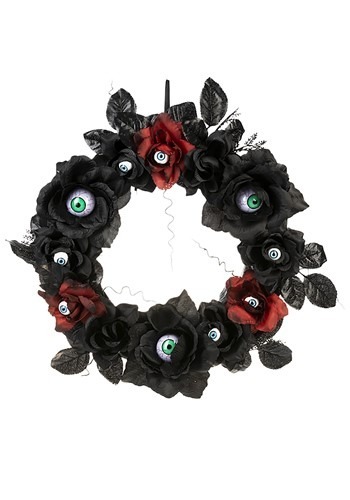 This reusable seasonal wreath is sure to set the right tone for your Halloween visitors. Black and red flowers make up the base. Multi-colored eyes are inserted into the middle of many of the flowers to really drive home an eerie image! The wreath comes with a loop to make sure hanging this for the Halloween season is quick and easy. Want more decor that treads that dark and dignified line? Check out our glittering black LED candles, poseable skeletons, and our wide variety of pumpkins to tailor your Halloween display to your elevated tastes!